Experience charming hospitality at this homestay set in peaceful gardens in the Chamundi Hills just 4 kilometres from Mysore city. You are a guest of the Achaiah family, who are happy to share their home and culture with you, giving you a taste of family life in India. Your room is in a building in the garden giving you a degree of privacy. There are just 4 guest rooms, all with air conditioning, 24-hour electricity and WiFi internet access. Each room has an en-suite shower room, and all share a veranda where you can sit and listen to birdsong in the garden. Meals are eaten in the family home. Breakfast is a treat, with a selection of Indian and international dishes, using a high proportion of organic produce. Dinner is available on request, and is a good way to experience Kodava cuisine. Keen cooks and gastronomes can take part in cookery classes (it is advisable to arrange these in advance), to learn how to recreate authentic family favourites and brush up on culinary skills. Yoga sessions and Ayurveda treatments can be arranged, and performances of traditional music and dance are organised on occasional evenings. Open: Gitanjali Homestay is open all year. Location: This homestay is located near the Chamundi Hills 4 kms from the city of Mysore, also known as Mysuru, Karnataka state. Rooms: There are 4 guest rooms located in a building in the grounds. Each is air-conditioned, has an en-suite bathroom with a full running water and a supply of toiletries, and has access to a shared veranda. Every room has a kettle and supply of tea and coffee, full electricity and WiFi internet access. Activities: You can go sightseeing in Mysore. The homestay can arrange cookery classes based on Kodava cuisine, cultural performances of music and dance, yoga sessions and Ayurveda treatments, all offered subject to availability. Facilities: There are attractive gardens. While here you are highly likely to encounter the pet dog and cats. Dining: Enjoy home-cooked Kodava cuisine served in the family home. Breakfast consists of both Indian and international dishes, with dinner and special group meals available on request. Communication: There is WiFi internet access in guest rooms. Notes: Gitanjali is owned and run by the Achaiah family, members of the minority Kodava community. As well as being a family home it has been operating as a homestay since about 2010. 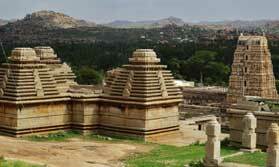 Experience the history, culture, nature and wildlife of Karnataka, rounded off with easy days by the Arabian Sea.